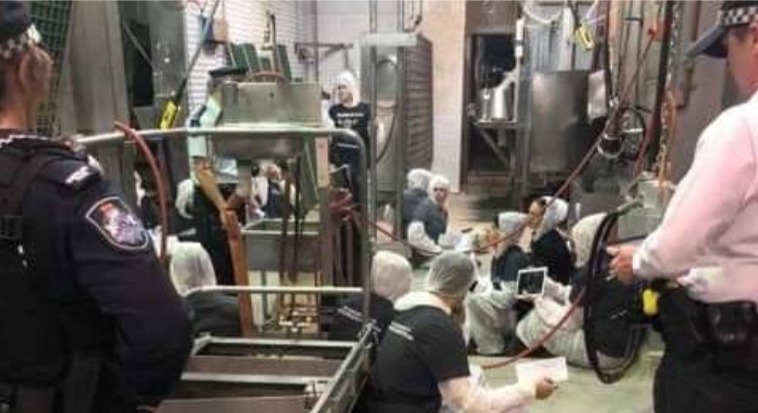 ANIMAL activists have occupied abattoirs, protested at other processing plants across Australia and been arrested at a Melbourne demonstration as part of a series of planned actions today. The widely-telegraphed campaign of disruption and trespass has been undertaken by groups of anti-meat activists in several locations in Victoria, New South Wales Queensland and Tasmania. The protests generated mainstream media attention, but also condemnation from political and industry leaders and waves of opposing comments on social media. Protestors this morning blocked a major intersection in Melbourne causing peak hour traffic chaos by parking vehicles across roads to prevent transport access to meat processing plants. Australian Meat Industry Council chief executive officer Patrick Hutchinson called for a strong and rapid response after activists illegally entered several member operations this morning, putting themselves, hundreds of workers and thousands of animals at risk. AMIC said at least five AMIC member businesses were targeted in the invasions, led by vegan activists. “What this amounts to is workers in regional and rural Australia being impacted by people who are not part of their communities. “They come in, they cause trouble, they create images that are not representative of the work our members do, they damage a business’s ability to operate, and then they’re gone,” Mr Hutchinson said. The animal activist protest in the Melbourne CBD this morning. Photo – VicTraffic. Victoria Police said they arrested 38 people, including two 17-year-olds and a 15-year-old, following the protest in Melbourne’s central; business district this morning. The protesters have been charged to appear in court. 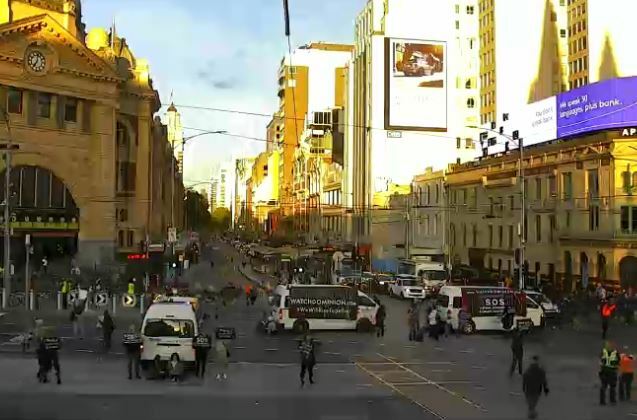 It is understood three vehicles were used to block the intersection of Flinders and Swanston streets, with a number of people chaining themselves to vehicles, Victoria Police said. The protesters were arrested in relation to obstructing a roadway, resisting or obstructing police, and are assisting police with their enquiries. Three vehicles were towed and the scene has now cleared. “Police were not engaged with prior to the protest that took place in Melbourne CBD this morning,” he said. “This lack of engagement puts the entire community at risk with road closures and delays to transport services,” he said. Victorian Farmers Federation president David Jochinke said it was fortunate the protests, while causing disruption to the public and businesses, appear to have been peaceful. “The protesters must show respect for the choices of others – people who enjoy chocolate for a treat, consume milk after exercise to assist with muscle recovery, through to those who start their day with scrambled eggs on toast and celebrate family events with a roast dinner or barbeque,” he said. “While farmers and city-based consumers may at times live very different lives, we actually have many things in common. “We value family and safety, we care for our animals be they pets or farm animals, and we pride ourselves in growing and consuming great food,” he said. Sheep Central believes nine people were arrested at Goulburn in NSW, after chaining themselves to a conveyor at the Southern Meats plant and refusing to move. No arrests have been made against trespassing activists at the Carey Bros plant at Yangan in Queensland, where the State Government yesterday said it was increasing powers to stop animal rights protesters invading farms for protests. Click here to read the government statement. “Fair minded Australians find this behaviour extreme,” he said. Click here to read Mr Littleproud’s statement. – Dairy farmers near Warwick told ABC they were confronted by activists outside their property about 6:30am after they had Carey Brothers abattoir. Farmer Jason Christensen said five or six cars pulled up near a herd of heifers and had scared the animals. “Dad had the main confrontation with them — swearing at dad, trying to get at him — they were trying to tell him he should be growing vegetables.” See the full ABC story here. – A small group of protested parked a Pantech truck across a road near Pakenham, blocking access to the G &K O’Connor abattoir, and chained themselves to the vehicle. – Another group broke into and attached themselves machinery with chains at the Goulburn abattoir, where nine were arrested after being cut free and refusing to leave. – Other locations targeted included the MC Herd abattoir in Geelong, Westside Meats at Bacchus Marsh, Australian Food Group plant at Laverton. – In Tasmania, 20 activists occupied the foyer of ministerial offices at Salamanca Place, specifically targeting the office of the Minister for Primary Industries.